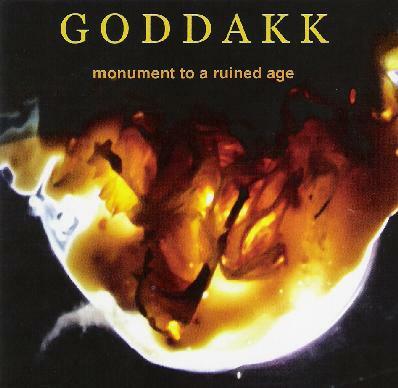 Goddakk - "Monument to a Ruined Age"
Goddakk is a solo project from Boston based musician Martin Newman (burMonter, Plumerai, December Sundays) on guitars, bass, keyboards and voice, though the promo sheet notes that the dominant instrument is a Fender VI bass run through loops & effects. I really enjoyed this album. From start to finish Newman treats us to a set of creatively constructed contrasts that bring together sound-art, a film soundtrack feel and an odd sense of melody and song. I love the blend of frenetic and off-kilter patterns (including an oddly song-like melody) laid over a steady, stone cold drone on "Opened". Ditto for "Kalifornia", with its machine-like sounds and textures combined with drones and a repetitive melodic phrase. "One Hundreds" is a strange piece that features a Robert Fripp styled guitar-scape in a completely NON-Fripp setting. I love the cool funky guitar grooves amidst the sound cacophony on "Your Guilty Prize". "Romeo Romeo" manages to glom together the Fripp fun and funk guitar into one avant-freaky mish-mash that culminates into a crazed symphony of looped patterns. "Unfortunates" struck me as a drugged avant-garde version of a Morricone soundtrack. "Human Beings" sees Newman travel into deep space, producing a cosmic piece that brings to mind early 70's Ash Ra Tempel meets modern day sound art experimentations. One of my favorites of the set. And the closing track, "Yto Nobogo", is the longest piece on the CD and winds things down nicely, bringing together all the elements that cropped up throughout the album into one experimental and aesthetically pleasing excursion. Wow, LOTS happening on this album! Newman excels at assembling disparate elements of sound, ambience and melody into cohesive and thought provoking wholes. Call it ambient music for those who like to explore and experiment but don't need the meditational bits. This is one you can play over and over and find something new and exciting every time.